Join us in downtown Hartsville to kick-off the Hartsville for the Holidays season at the Downtown Holiday Open House & Centennial Tree Lighting! Our city will come alive with holiday cheer on Thursday, November 16th from 6-9 pm at this celebratory event hosted by the City of Hartsville in partnership with Main Street Hartsville. Start the holiday celebration off early in Centennial Park with a holiday performance by the Hartsville High School Chorus beginning at 5:30 pm. 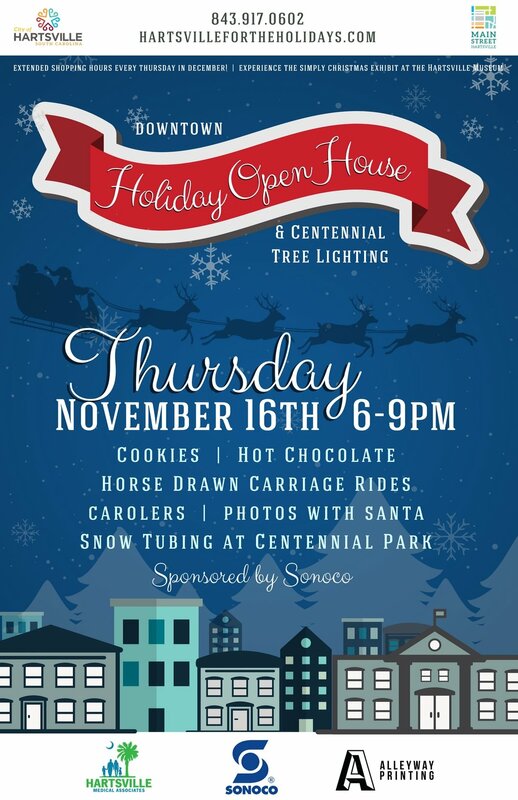 At 6:00 pm, gather with your friends and family and join our community at the annual lighting of the Centennial Christmas Tree. Indulge in extended shopping hours and holiday specials at Main Street Hartsville businesses during Downtown Holiday Open House. Warm up with hot chocolate and cookies while whispering your holiday wishlist to Santa Claus inside City Hall. Horse-drawn carriage rides and a chance of real snow make this magical holiday tradition one that you won’t want to miss. We look forward to kicking off the holidays with you! Camden Carriage Company will pick up riders for carriage rides on East College Avenue and stroll them through downtown. Santa Claus will be waiting inside City Hall (100 E Carolina Ave) for photos from 6:30-9 pm. The Simply Christmas Exhibit at the Hartsville Museum (222 N 5th St) will also be open for a special look at holiday traditions from past to present and offers a peek inside Santa’s Workshop. 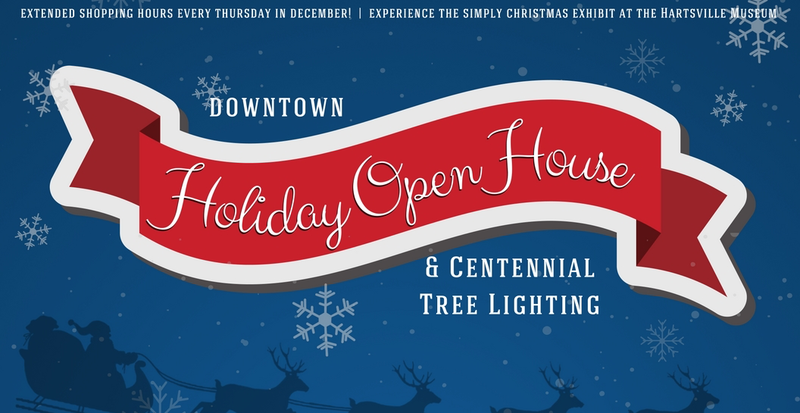 Click the button below to open the interactive online map of all the events at Downtown Holiday Open House. A scheduled of all of this year’s holiday events is below. Visit HartsvilleForTheHolidays.com for full details.